The situation is dire. Little or no action is taken on climate change. Earth is facing a potential temperature rise of more than 10°C or 18°F by 2026. What is happening in the Arctic is critical. While Earth as a whole is experiencing rapid warming, warming in the Arctic is escalating even faster and accelerating, due to feedbacks such as snow and ice demise and destabilizing sediments at seafloor of the Arctic Ocean. These sediments contain huge amounts of methane in the form of hydrates and free gas. 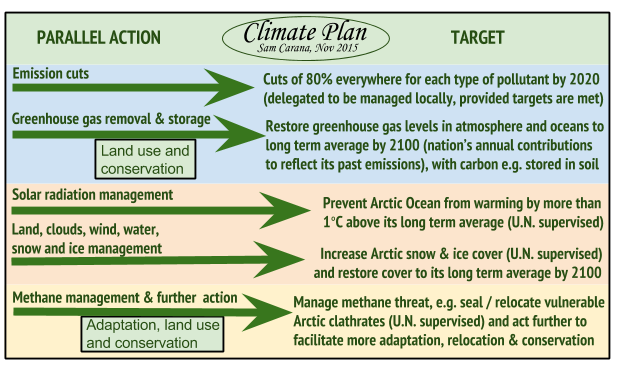 The Climate Plan responds to this threat through multiple lines of action (green lines in image below). The comprehensive and effective action depicted in above image is described in more detail below. Each of these three parts comes with multiple lines of action to be executed in parallel. Each line of action aims to achieve specific targets, yet one line of action can also help with progress on another line of action. Importantly though, progress on one line should not be used as an excuse to delay action on another line. 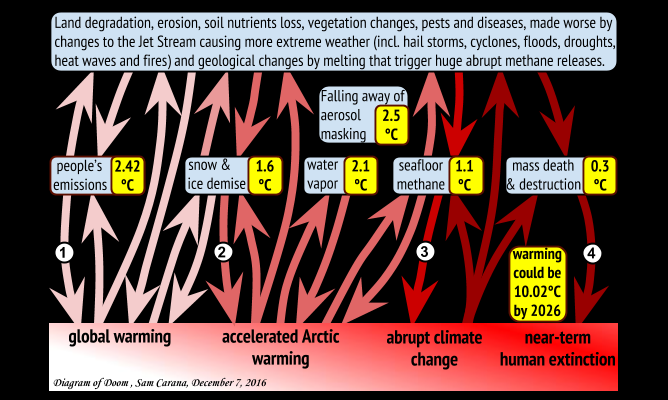 While lines of action are grouped together in three parts, numbers merely show relationships with the kinds of warming. The green lines of action each need to be implemented in parallel, i.e. progress on one line of action should not be made dependent on progress on another line of action. 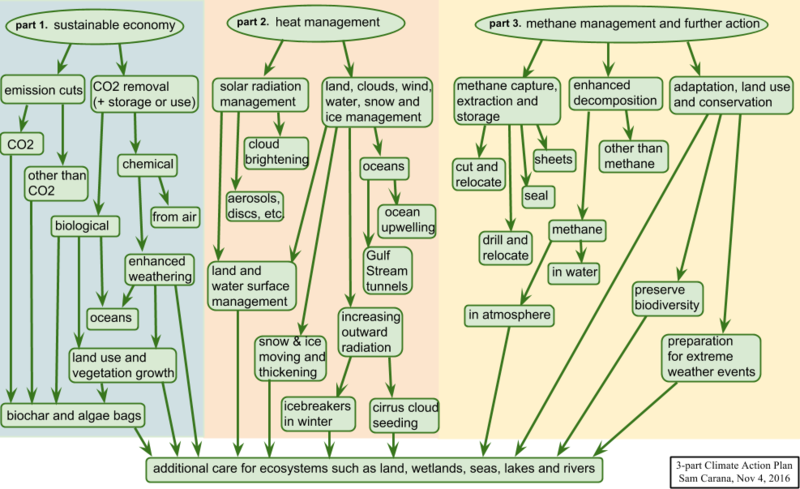 Besides helping each other, these lines of action will also lead to additional care for ecosystems, such as land, wetlands, lakes and rivers. Use of feebates is highly recommended by the Climate Plan. Feebates can be implemented in budget-neutral ways, so their implementation doesn't need to be disruptive in regard to other policies. Furthermore, the administrative framework is typically already in place, i.e. implementation of feebates can take place on the back of sales taxes, vouchers, tax returns and other policy instruments that are already commonly used all over the world. Feebates combine disincentives for polluting products with incentives for the cleaner alternatives. This is part of why feebates are so effective in achieving a rapid shift to clean products. As an example, differential rates applied by local councils to land ownership can facilitate growth of soil carbon content. Similarly, differential vehicle registration fees can facilitate emission cuts. Such measures can typically be implemented now, i.e. without requiring prior international agreement. In other words, local communities can start implementing (parts of) the Climate Plan immediately. While feebates are recommended as the most effective policy instruments, the decision how to implement the necessary action (e.g. efforts to reduce pollution levels) is largely delegated to state or provincial level, while states or provinces can similarly delegate decisions to local communities. 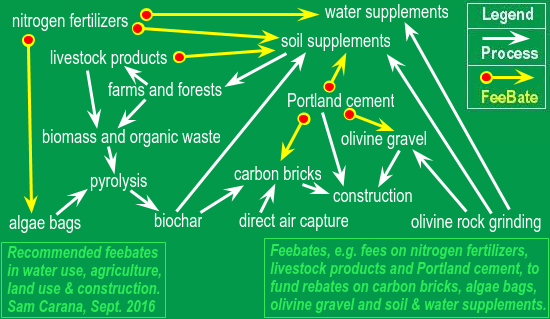 Examples of feebate policies are depicted in the image below. States or provinces can thus implement the policies that they feel will fit their circumstances best, provided they do each achieve their targets. Such targets are set by national government in line with international agreements, and assisted by ongoing monitoring and research as to which ways can best make safe progress and achieve targets most effectively. 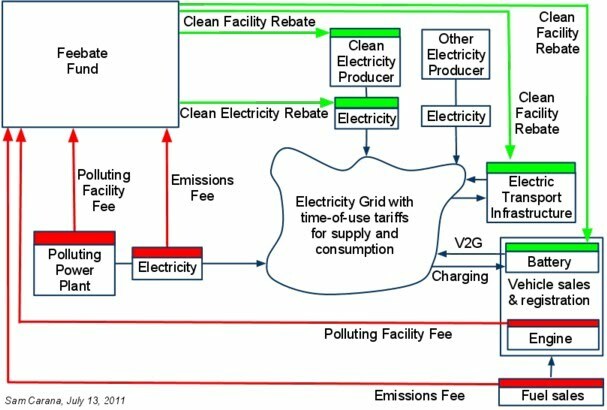 Local implementation encourages that revenues from fees on polluting products are used to fund the necessary shift to clean products locally. This will help achieve the shift where it’s needed most. The two above images above depict energy feebates and other feebates. 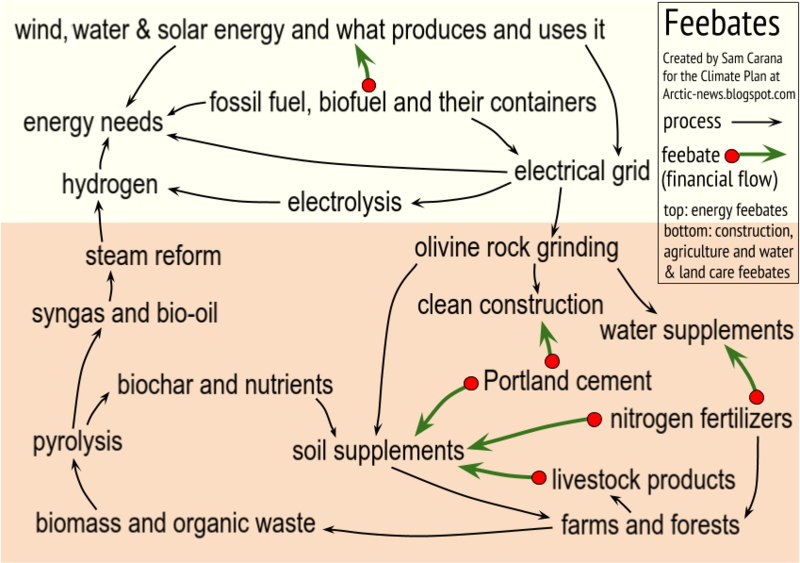 Energy feebates can best clean up energy, while other feebates can best raise revenue for carbon dioxide removal and further action. Energy feebates can phase themselves out, completing the necessary shift to clean energy within years, rather than decades. Since carbon dioxide removal (CDR) will need to continue for longer, it makes sense to raise funding for CDR from other sources, such as sales of livestock products, nitrogen fertilizers and Portland cement. Simply the best plan for the future ever. It must be implemented ASAP!